3. In the pay head field, Start type the details three options namely. Or you can enter details manually for each employee. Copy from parent value will be very help full to configure Statutory Compliances for each employee. If you select Copy from Employee, the salary details defined for any Employee, irrespective of Employee Group, can be selected. If you select Copy from Parent Value, the Salary details defined for the Employee group to which the Employee belongs will appear in the screen. If you select Start Afresh, you have to select the pay heads from the List of Pay Heads and enter the values for necessary pay heads, if required. If the options Allow Copy from Employee is Enable in F12: then the option copy from Employee will be displayed. Modify values for the necessary Pay Heads as per Employee Eligibility. Allow to Override Slab Percentage: Set Allow to Override Slab Percentage to No to prevent changes made to Slab Percentages. You can set it to Yes, to override the percentages already defined at the Pay Head Level. 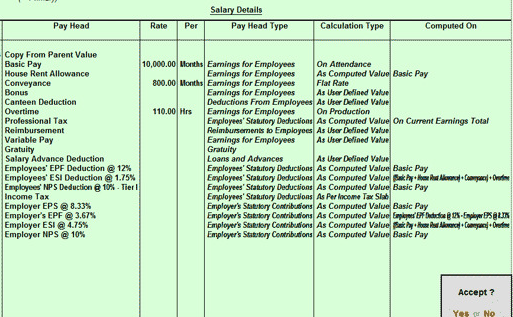 Show Pay Head Type: Set show Pay Head Type to Yes to Display if the Pay Head is an Earning or Deduction in the Salary Details screen. Show Calculation Type: Set Show Calculation Type to yes to display the method of Calculation adopted (As computed value, As user Defined Value, Flat Rate, On Attendance or On Production).